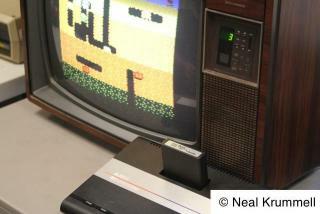 Atari Party is an annual (more or less) exhibition of classic Atari video games from the 1970s, 1980s and 1990s. The event is free, and open to the public. No registration or RSVP is required. 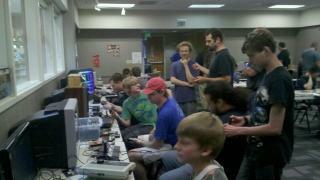 Volunteers donate their time and loan their games and systems to the event. 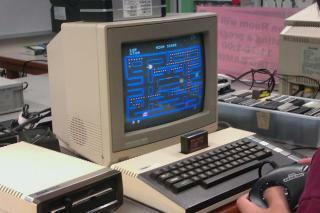 Please note that Atari Party is not a sales or trading event, it's only an exhibit. Atari Party is for anyone interested in reliving their childhood, or showing their own children the games that mom & dad grew up with. 2013-09-14 - Robert Bernardo sent in some additional photos of this year's event. Enjoy! 2013-07-06 - The day is upon us! I'm all packed up... see you at the library! 2013-05-16 - A flyer for this year's event has been made. I've posted it around downtown Davis, but please feel free to print it and post it elsewhere, too! 2013-05-14 - This year's event is already gaterhing volunteers & exhibitors. If you'd like to help out too, see that page's "How to help" section. 2013-05-07 - We've already got some sponsors lined up to donate some prizes for the free prize drawing! 2013-05-03 - This year's date and venue is confirmed! We're once again at the public library in Davis, all day Saturday, July 6th. "Atari" is a registered trademark of Atari, Inc. All other trademarks or service marks are the property of their respective owner.